The Indians of the Seminole tribe in Florida raised their Chickee huts on stilts in the early 1800s, to protect themselves from the damp ground and parasites, allowing air to circulate in a healthful way under the construction. Later, in the 1930s, a cluster of defensively raised houses, Stiltsville, was built on the water of Biscayne Bay, Miami. We learned all this from Rene Gonzalez, the Miami-based designer who has reinterpreted these sources of inspiration (along with the fundamental paradigms of the Prairie Houses of Frank Lloyd Wright or the Five Points of Architecture of Le Corbusier) to create the design of his Prairie Avenue Residence. 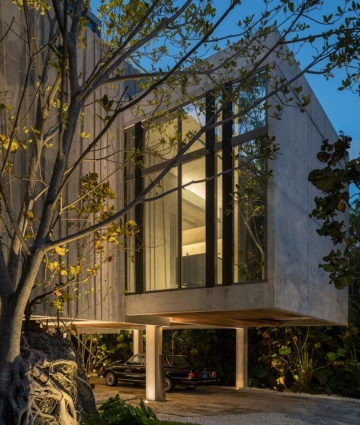 This is the first of a series of houses built on stilts in Miami Beach, Florida to specifically address the threat of the rising sea level, which in recent times has become a vivid concern due to the impact of global warming. So this residential proposal, while fully inserted in the typological current of luxury residential design, demonstrates that projects can be creatively competitive, at the service of necessary improvement of contemporary living conditions in relation to the changing environment. All the living spaces are raised over a sculptural garden of tropical vegetation that provides drainage and becomes vital organic material, perceptible in a mutable way depending on the levels of the water below. 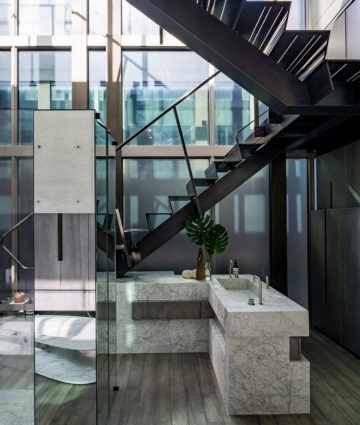 Access is provided by a retracting staircase in bronze-finish brass, which can be mechanically raised when necessary and placed in a hollow volume at the center of the house. At the top of this motorized naval-style stairway, custom-made with great expertise by the Italian company Marzorati Ronchetti – like the internal fixed staircase, also in bronze-finished brass – the first volume that meets the eye is the central one of the long swimming pool, which through careful axial symmetry further underlines the delicate connection between the terrain and the residential spaces. 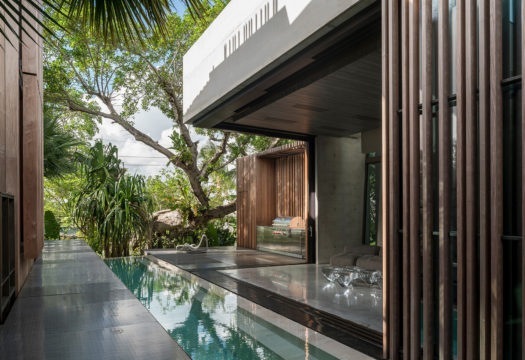 Around the pool there are islands for the living area, bedrooms and guestrooms, in an uninterrupted sequence with an open layout, emphasized by the use of large glazed portions and full-height sliding doors. The arrangement produces further connections with the natural habitat and its basic elements: water, vegetation and light. 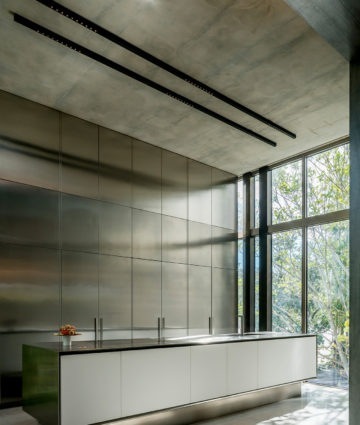 Built as a vacation home for a client who spends most of the year in a colder climate, the architecture formulates a dynamic relationship on multiple levels with the landscape, down to the smallest details. And the design furnishings? Very sophisticated, avant-garde pieces, unique items selected from all over the world, like the works of art that accompany theme, chosen in collaboration with the client. In this context, these creations are like actors in a theater piece. In other words: architecture that creates beauty and solves problems. 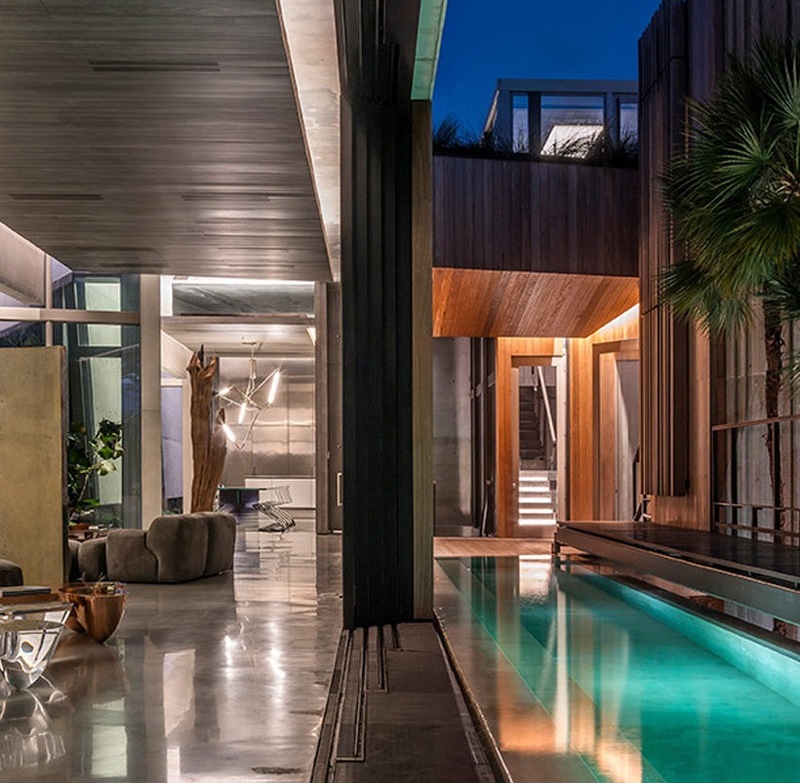 The single space that encompasses the living-dining-kitchen zones on the first level, opening with full-height sliding doors towards the central swimming pool (faced in travertine), in pursuit of maximum fusion with the outdoor setting. 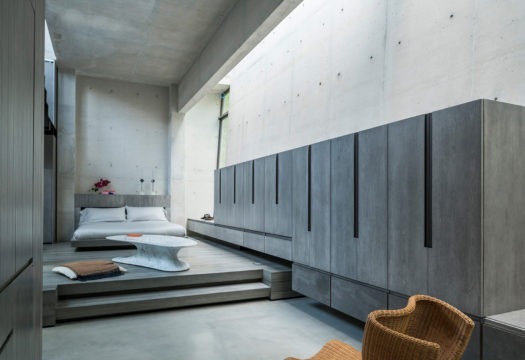 Sloping perimeter walls in fair-face concrete, floors in concrete with a glossy finish, and partitions in ipe wood set the stage for upholstered furniture by Vincenzo De Cotiis (2007) and the Quark tables in plexiglas (2009) and copper (2014) by Emmanuel Babled. In the background, the dining area. Table with glass top by Germans Ermics, Z chairs in carbon fiber by Giovanni Pagnotta (2002), tubular lamp in silver-plated brass by Vincenzo De Cotiis (2012). The building is raised off the ground by pillars in reinforced concrete. 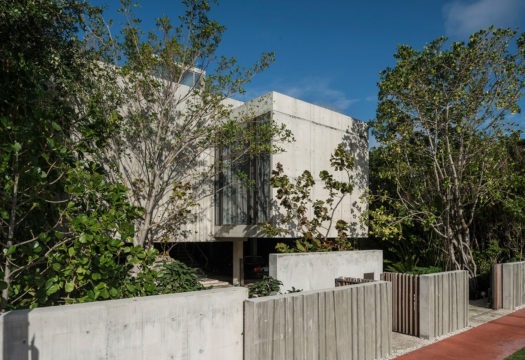 The lightness of the architectural structure is enhanced by the area below, organized as a garden, a garage and a pedestrian passage, with landscaping by Mauricio Del Valle Design. The living spaces are on the first floor, like the raised swimming pool, and are reached by way of a staircase that retracts (when necessary) in bronze-finish brass, produced by Marzorati Ronchetti. View of the internal construction that produces a dematerialization of the walled enclosure and partial screens to grant seamless fluidity to the levels, and a sense of formal and materic unity. The kitchen with an island and cabinets by Boffi and the Nuit lighting system by Kreon. A bathroom that mixes facings in Carrara marble and accessories by Agape (distributed by Luminaire). 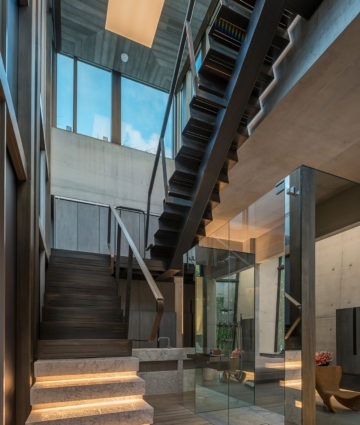 In the background, the bronze-finish brass fixed staircase with double ramp, also custom made by Marzorati Ronchetti, leading to the roof terrace. 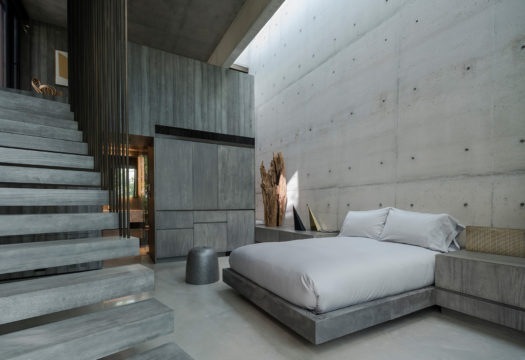 Private bedroom that continues the same linguistic and formal tone: wooden textures with a gray finish harmonize with fair-face concrete walls and custom fixed furnishings by RGA.